There are three decent plastic models of Bundeswehr Marder family of vehicles available in 1/35 scale. 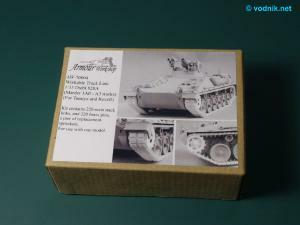 The first is very old Schuetzenpanzer Marder kit from Tamiya, which represents the earliest version of this AFV. Then there is later release of this Tamiya kit with some parts added and renamed to Marder 1A2. Finally there is also a model of Marder 1A3 variant from Revell of Germany - this model is Revell's own tooling and not related in any way to Tamiya kits. Revell's kit is superior to Japanese manufacturer's models, but Tamiya kits are not bad, particularly considering their age. All three kits however share one flaw - very poor one piece vinyl tracks. Those in Revell kit are slightly better, but not by much and they are made of soft, very rubber-like vinyl. One distinguishing feature of real Marder tracks are big guide horns with holes in them. Obviously none of vinyl tracks included in model kits has this feature represented, as it is impossible to make in this kind of tracks. 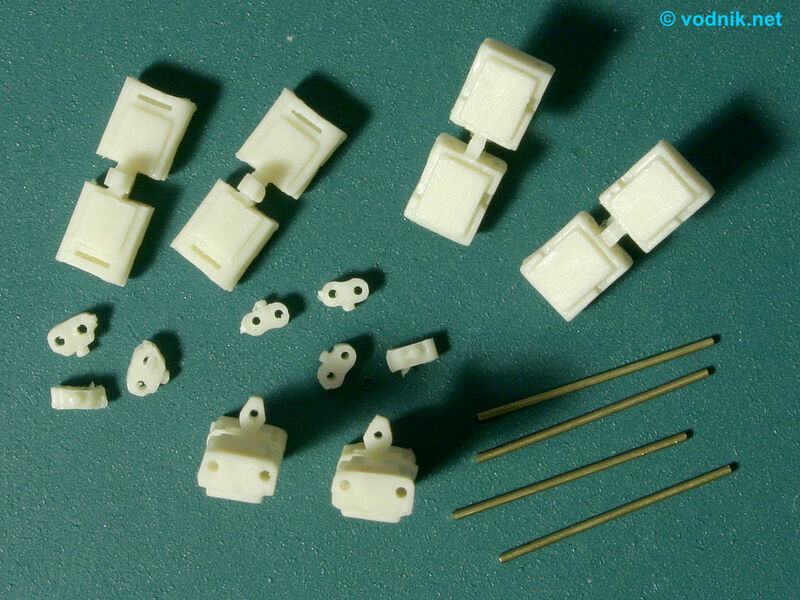 So far there were only one aftermarket tracks available for Marder models: resin link and length tracks by Elite Model company from Germany. 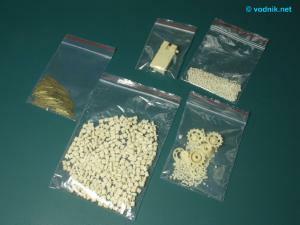 This company makes several resin kits of Marder and other vehicles based on similar suspension (e.g. Jaguar) and using the same kind of tracks, so their tracks were design for their own models. Unfortunately these tracks were very poor - inaccurate and very poorly molded (you can read my review >here<) - so they offered no improvement over kit tracks. 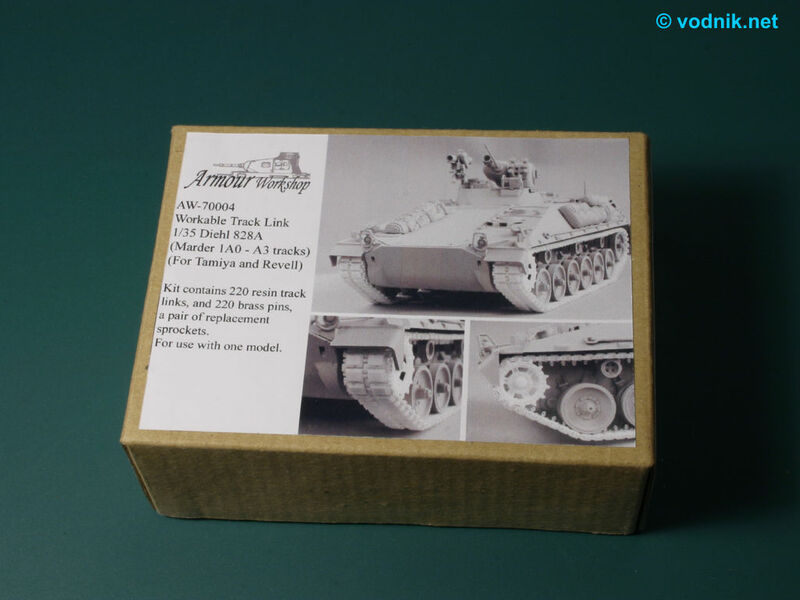 And now finally the new tracks are available - Armour Workshop company from Hong Kong made completely new, individual link workable resin tracks designed to fit both Tamiya and Revell kits. I'm sure that with minimal work they can also be used to replace ugly tracks in Elite's Jaguar and Marder models, particularly that resin sprockets are included. Click on picture to enlarge it. Track parts. Click on picture to enlarge it. Sprocket parts. Parts are well cast and are ready for assembly out of the box. In theory no cleanup at all is necessary, but in fact I had to remove some very minor flash from some of the link connectors. But I didn't even have to use the knife to do it - a few touches with the tip of tweezers, which I used to manipulate resin parts, and flash was gone. There is also some flash on sprocket wheel parts and this may require the use of knife to remove, but it is nothing serious really. There are no air bubble holes in parts - at least I have not noticed any, although obviously I wasn't able to examine each and every resin part. 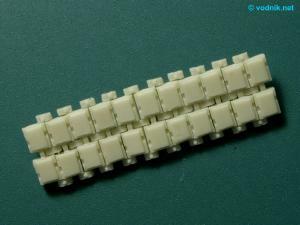 Both link connectors and track links have holes for brass pins pre-drilled in them. 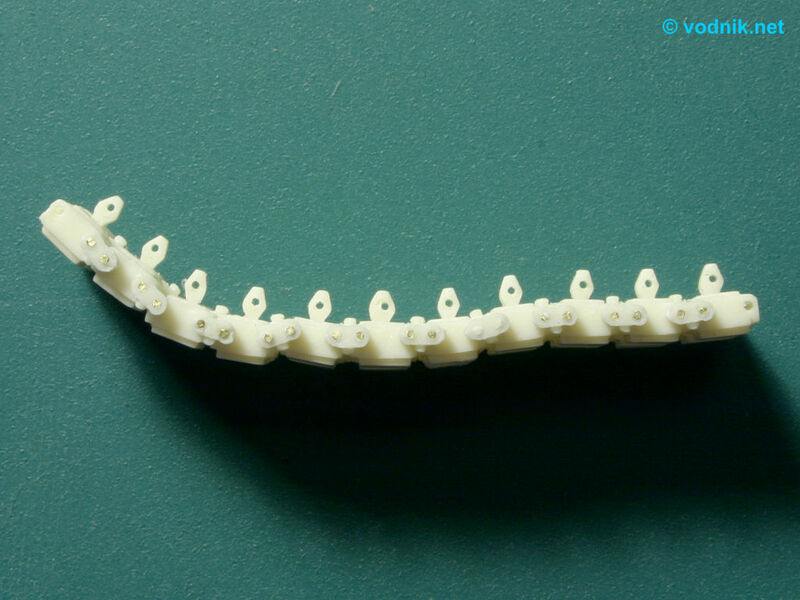 There is very small amount of excess resin on some of the side connectors in place where resin pouring channel was, but it is easiest to remove with a tip of sharp knife when tracks are already assembled. Brass pins are pre-cut to proper length and need no preparation. Track links have crisp and reasonably accurate details on both sides. Particularly the outer "road" side is very well reproduced, while the inner side while generally OK is not completely correct with slightly too large rubber pads and too narrow recesses on both sides. The most important feature of new tracks however are hollow guide horns. The holes are slightly too small, but they look great anyway! All link connectors have bolt head details on one side. 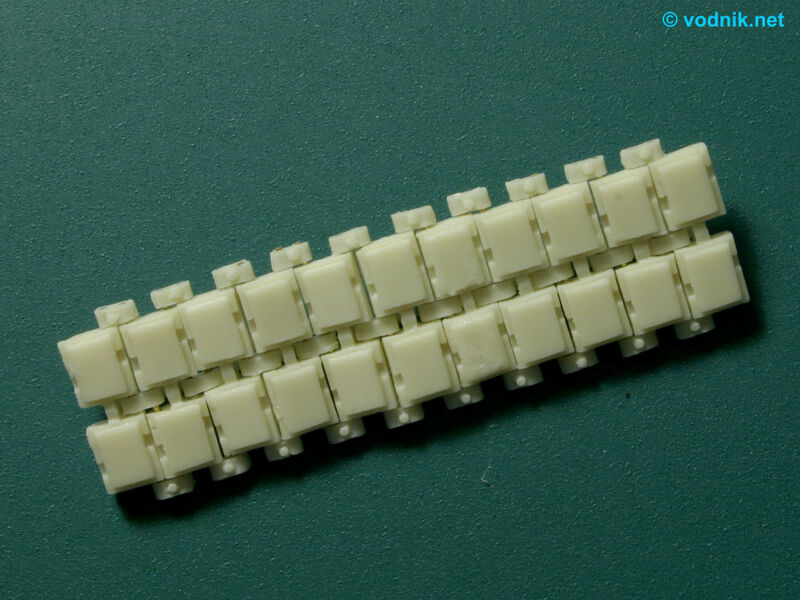 The assembly of tracks is very simple in theory - you take two links, put the center link between them, slide two pins into holes in links and connectors and finally add two side connectors on both ends of pins. Easy? Well... not really... The problem is that link connectors are really small and manipulating them is very difficult. Also the fit of brass pins in holes drilled (or actually cast) in side connectors is rather tight. This means that track don't require any glue to hold together once assembled, but it makes the assembly process more difficult. Luckily the fit of pins in track links and in center connectors is very good and they slide in easily, with only part alignment being a small problem. 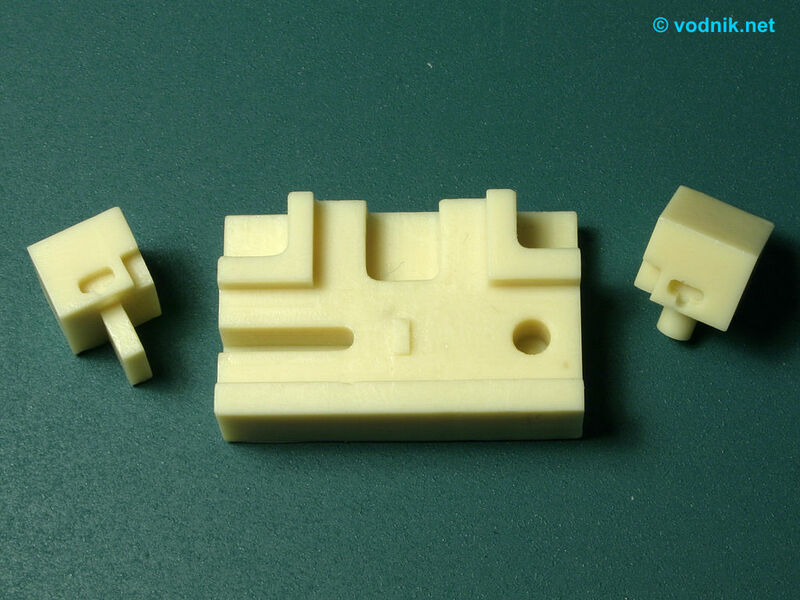 To help in putting the tracks together, Armour Workshop thoughtfully included a three-part resin jig in the set. Unfortunately the lack of instructions means that modelers must figure out how to use the jig themselves. Luckily it is not difficult - two smaller parts have holes in them to which side connectors fit perfectly and one of these parts is designed to slide on a small "rail" on the jig, while the other part has a pin on the bottom, which secures it to the jig base in fixed position. So how the jig works? Well, I'm not sure how it was supposed to be used, but this is what I did: First you put two links on a base, aligning them to the raised edge of the jig. In the middle of jig base is a small raised rectangle - it should be in the middle of track links. On this raised rectangle you should put the center connector (be careful to put it with the bolt detail up) and then holding parts in place with your finger, slide two brass pins from any side into holes in track links. Raised area on the jig base should raise the center connector to the proper height to let pins slide through it easily. It didn't work all that well in my jig, as the connector was slightly too low. I attached a tiny piece of Tamiya masking tape on top of raised rectangle on the base and jig started to work fine! When you already have two links with center connector and two pins assembled together, you put one side connector into the hole in the smaller jig part, the one with pin on the bottom. 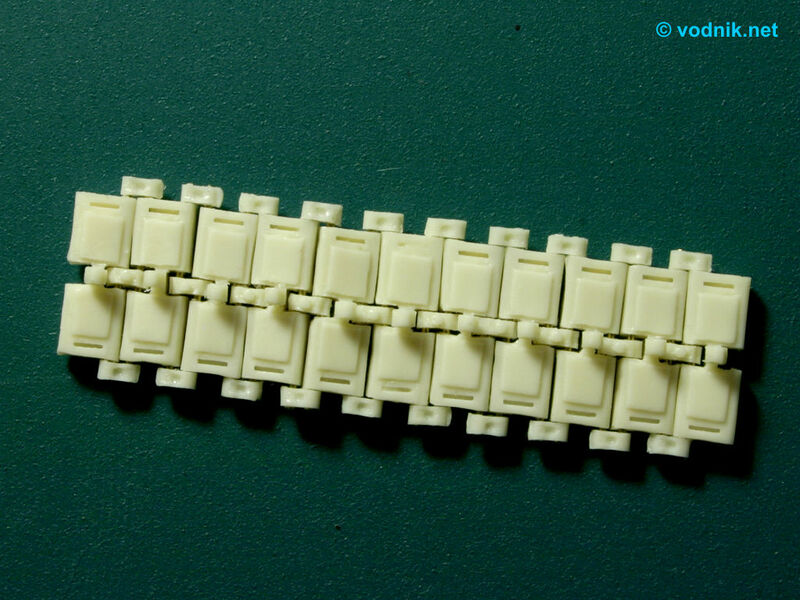 You put this part on the base next to your track links (to do this you have to have both pin ends hidden inside the track link on this side of link). Then you take the other small jig part, put it on its "rail" and push the brass rods with it until they go all the way into the end connector inserted in the other jig part. All the time you must hold all parts to jig base with your fingers. Then you put the second side connector in the hole in moving part of the jig, put this part back on its "rail" and again push it so the end connector slides onto the tips of brass pins. And now repeat it all... well, large number of times. 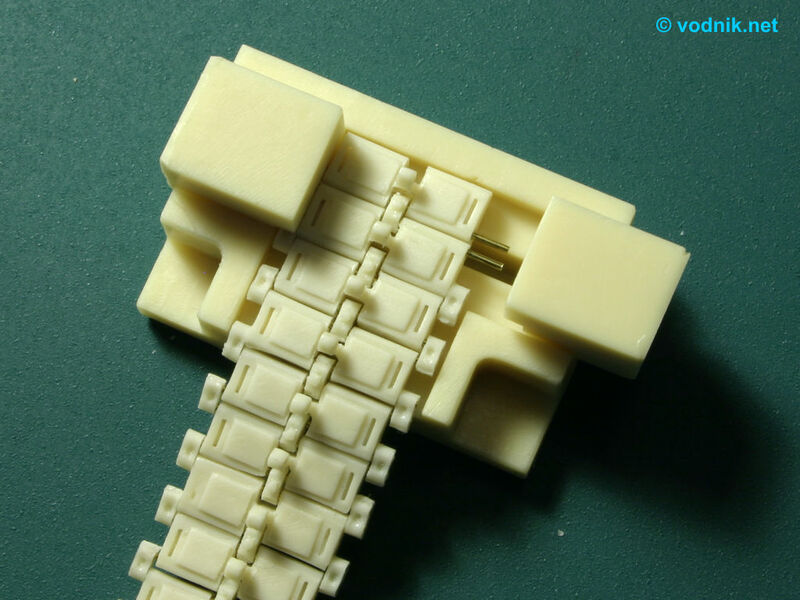 The number of links needed for one track run on a Marder model is not given, so you must simply test fit tracks to suspension built earlier to know when to end adding links. But I have a feeling that we get more then a few spare links in the set. The assembly process is not really as simple as described above, because parts in the jig are not positively held in one position and there are also minute differences in positions of holes in parts, what means that constant adjustments are needed to make sure that pins find their way into the holes. Generally this is not a kind of tracks which you can assemble while watching football game on a TV - you really must pay attention to what you do. Don't expect to be able to put these tracks together in one afternoon. But on the other hand try to imagine what a nightmare would the assembly of these tracks be if they wouldn't have come with pre-drilled holes and pre-cut brass pins! Assembly of sprocket wheels is very easy, but it is important to attach center rings properly, as they fit both ways! Only one way however is correct and if you put it wrong, the tracks will not fit on wheels! So be sure to test fit the sprocket with assembled section of tracks to be sure that you put parts correctly together, before using any glue. 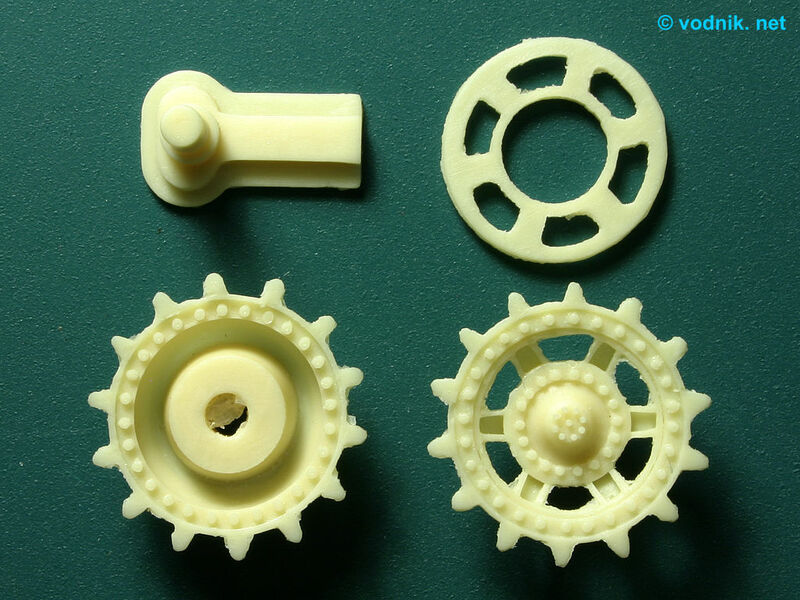 The holes in sprocket parts fit well to the axles molded on the hull of Revell kit, so no modifications of kit parts are necessary. For Tamiya models we get two resin suspension arm/axle parts, which directly replace kit plastic parts. 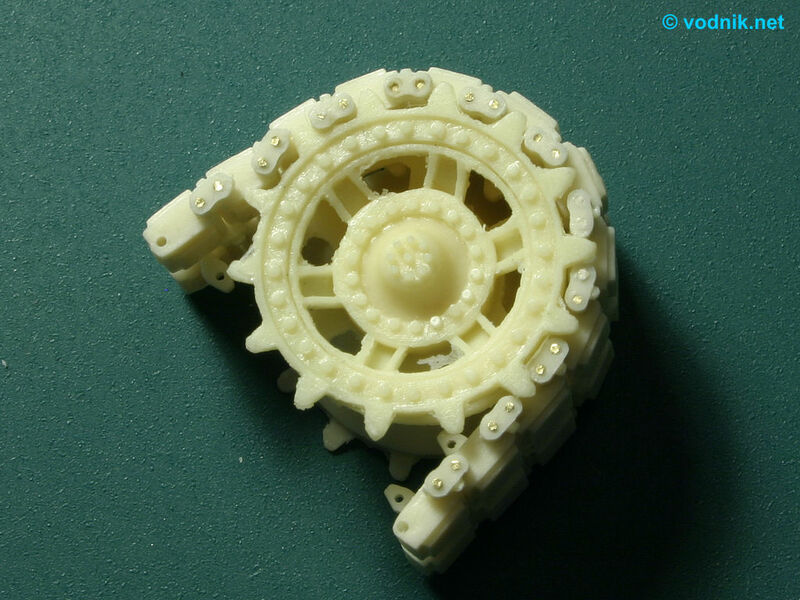 Assembled tracks fit very well to resin drive sprockets and they look very good! Far superior to any vinyl tracks and to Elite resin ones. Click on picture to enlarge it. Assembled section of track. Section of track on sprocket wheel. Many thanks to Leo Lee of Armour Workshop for the review sample!